The majority of the best golf courses in Australia are concentrated around the main tourist areas on the eastern coast and in the south close to Melbourne. Overall however, there are hundreds of options all over the country. Melbourne is the heartland of golf tours in Australia, featuring the best ranked course in the country, the Royal Melbourne. This fantastic green, in an area known as the Sandbelt, is just part of what has often been described as the best grouping of 18-hole courses anywhere on the planet. Lying just half an hour by car outside of the centre of the city, the Sanbelt features five of the country’s top 10 courses. 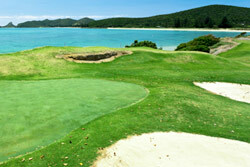 Golf tours on Australia’s East Coast include courses on the Mornington Peninsula, in North Queensland and around Sydney. A golf tour in this area is a great way to take in Australia’s two most popular cities while playing a few holes along the way. Other good options include golf and wine touring holidays around the famous Melbourne region, Perth and the Swan Valley area, with its many vineyards. The western part of the country offers some competitively-priced golf tours in Australia, which feature excellent courses away from the main tourist trails in the east of the country. It’s also possible to combine golfing and the beach with tours in and around both the Gold Coast and the Sunshine Coast in Queensland. Some golf courses in the north of the state even boast holes with views of the Great Barrier Reef. Blue Wander Golf offers a range of golf tours to some of the top courses on the east coast of New South Wales. We tour great golf courses like ‘Horizons’ at Port Stephens, ‘Pacific Dunes’ at Port Stephens, ‘Tallwoods’ at Hallidays Point and ‘The Vintage’ in the heart of the Hunter Valley. Golf Tourism Australia was established to cater for the needs of the travelling golfer for both Australian residents and international visitors.